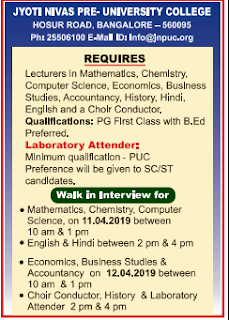 Candidates can attend the walk-in interview on 11th 12th April 2019 for Jyoti Nivas Pre-University College Lecturers / Lab Attenders Vacancies. Interview Slots are 10 Am to 1 Pm on 11th April 2019 for Maths, Chemistry, Computer and 2 Am to 4 Pm for English , Hindi and 12th April 2019 on 10 Am to 1 Pm for Economics , Business studies, Accountancy and 1 Am to 4 Pm for Choir conductor, History , Lab Attender. Further Details to see the Official website www.jnpuc.org. Required Details like Salary, Important dates, Selection Process, Qualification are given below. Starting Date to apply: 11-04-2019. Ending Date to apply: 12-04-2019. Interested applicants can attend the walk-in interview on 11th 12th April 2019 for Jyoti Nivas Pre-University College Lecturers / Lab Attenders Vacancies. Interview Slots are 10 Am to 1 Pm on 11th April 2019 for Maths, Chemistry, Computer and 2 Am to 4 Pm for English, Hindi and 12th April 2019 on 10 Am to 1 Pm for Economics , Business studies, Accountancy and 1 Am to 4 Pm for Choir conductor, History , Lab Attender Remaining Details are given below.